An award-winning novelist tells the deliciously candid story of her unconventional path to motherhood. Abu-Jaber (Birds of Paradise, 2011, etc.) grew up between the polarities of two strong personalities: that of her Arab father, Bud, on the one hand, and her maternal grandmother, Grace, on the other. Adversaries who also happened to agree on many things, they fought for the author’s attention through food: where Bud delighted with his spicy meat dishes, Grace tempted with her divine cakes and cookies. The struggle also centered around their desires for Abu-Jaber's life, with Bud demanding that she wed as soon as she was old enough and her grandmother warning that romance was “lie” and marriage and babies were “for women who [couldn’t] do much else.” Abu-Jaber, however, was determined to create her own life recipe, which proved harder than she imagined. Straight out of college, she married a man who was more convenience than lover and whom she divorced less than a year later. Secretly enchanted by “the idea of marriage,” she wed again in graduate school, this time to an intellectual for whom she felt no passion. In the midst of personal turmoil, her career thrived, but it wasn’t until her mid-30s that she finally settled into a relationship that satisfied her desires rather than those instilled by Bud and Grace. A decade later, Abu-Jaber suddenly found herself wanting to adopt a child, whom she named in honor of the woman who warned her against motherhood. Strong-willed yet tender, Gracie not only taught the author lessons in patience, giving, and self-acceptance. She also became the unexpected apple of Bud’s baby boy–coveting eye and the missing ingredient in an intergenerational recipe for family harmony. 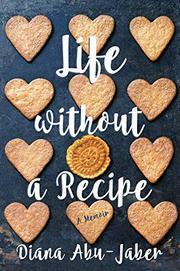 Generously seasoned by an abiding love of food and a keen eye for the nuances of human relationships, this book is a reminder that however unpredictable it may be, life is a dish to be savored. A delectably warm and wise memoir.